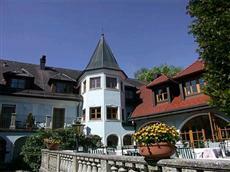 The Hotel Gasthof Doktorwirt Salzburg is located in the country on the outskirts of the city. This Salzburg accommodation is just minutes from several places of interest, such as the Hohensalzburg Fortress, the Mirabell Gardens, St. Peter's Monastery, Mozart's birthplace, the Salzburg Cathedral, and the festival halls. The Salzburg airport is only a short drive from the Hotel Gasthof Doktorwirt Salzburg. Taxi services are available, as well as plentiful public transportation. Most points of interest will require travel by bus or car. The guest rooms at the Hotel Gasthof Doktorwirt Salzburg are well equipped with en suite baths, complimentary toiletries, hair dryers, alarm clocks, and cable or satellite television. Non-smoking rooms may be requested, as well as room service. This centuries old inn offers many modern amenities. The Hotel Gasthof Doktorwirt Salzburg has an on-site restaurant and bar, a fully equipped gymnasium, tennis courts, a sauna, and a swimming pool. Business travelers may use one of three conference rooms, as well as wireless high-speed Internet connections. Childcare, laundry, and physician services are also available.